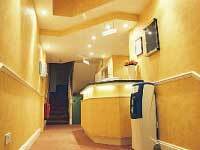 The Crownwall Hotel is located at 10 11 Craven Terrace in Central London. Check room availability using the search box on your right. Crownwall Hotel is easy to reach whether you arrive by Eurostar or Plane, British Rail or by London Underground. You will find us close to Paddington and Lancaster Gate Station. It is just 5 minutes walk from Paddington Station for Heathrow Express, British Rail, excellent bus and taxi service and five underground lines to choose from Centre, Bakerloo, Circle, District, Hammersmith City.